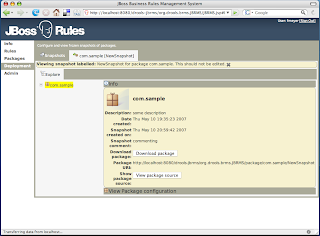 # After you have edited some rules in a package, you can go to the package feature, and build the whole package. 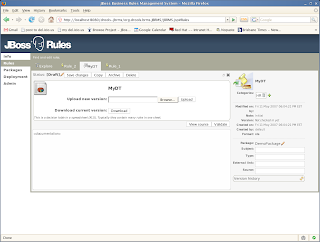 * If that succeeds, then you will be able to download a binary package file which can be deployed into a runtime system. Specifically, what format is the "binary package" in exactly? What type of runtime system would you deploy it to? The binary package is just a serialised pojo blob, nothing special. How does one utilize this serialized pojo inside a java method? How do the rule definitions, DRLs, etc get inserted into the Rules Engine? If I have the following method to load rules from .drl files, how would I replace it to accomodate the serialized pojo? 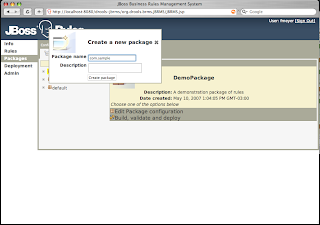 You unserialise the blob to a Package object, which is standard java, and then add the package to a RuleBase. Everything is stored as part of a Package object. We are working on an agent API to make the deployment process smoother and more declarative. The project is really great. but i am unable to download the binary package. 2. created a package associated with that category. 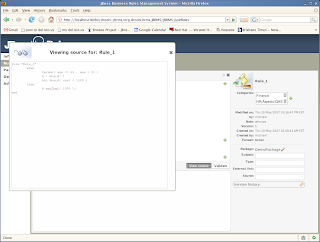 3.Loaded a fact model which is a bean class and linked it with the package. 4. created some business rules. 5.imported the bean class in the configure package option and saved the changes. 6. created a new snapshot. 7. Build the package and it shown a success message too. 8. Now tried to download the package but it is giving package not found. 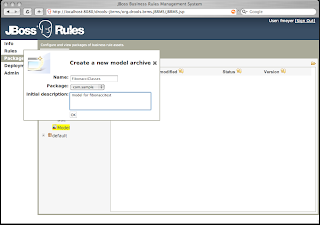 We have been using JBoss rules for a new project, but until now, the lack of a BRMS has meant that we been forced to look at commercial products. When I did get it to run, I could not import an object model and so could not create any rules at all. It simply did not do anything. I understand that the product is not yet ready for release, but I was surprised that I could not even import a JAR containing POJOs. Any ideas where I am going wrong? Any suggestions as to what the recommended web server / version of libraries to use? I would like the ability to import rules in drl form into the BRMS. You can do that, it allows you to use DRLs as assets, and publish as a Package. What it doesn't do is break the DRL down into individual rule assets, as it would be too hard to manage both the DRLs and the rules as seperate entities. Maybe one option is have the ability to "import" a drl as individual rules, but it will throw the drl away at the end. 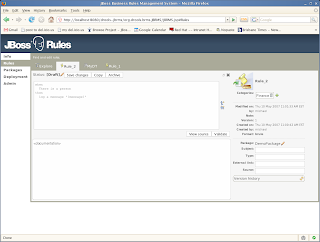 Is there a possibility to read the rules immediate from the database, without deploying to a serialized pojo blob? Or is this not good for performance? 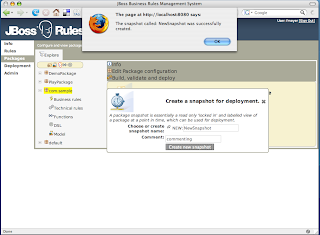 Does anyone run BRMS on jboss AS 4.0.2? I need to run it on that server but in doc recommended is 4.0.5. Thx for help! 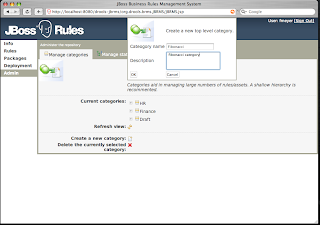 I'd just like to use a business rule repository and a visualization and management tools. So therefore I don't need a business rule engine or something like JBossRules Working Memory. 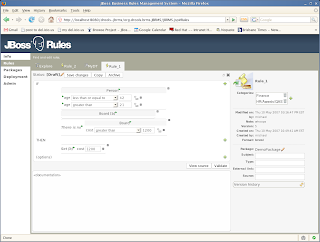 And what exactly is the difference of Drools and JBoss rules?